“King in the Wilderness” will be shown at noon Tuesday, Feb. 12, at the John M. Pfau Library, room PL-5005. 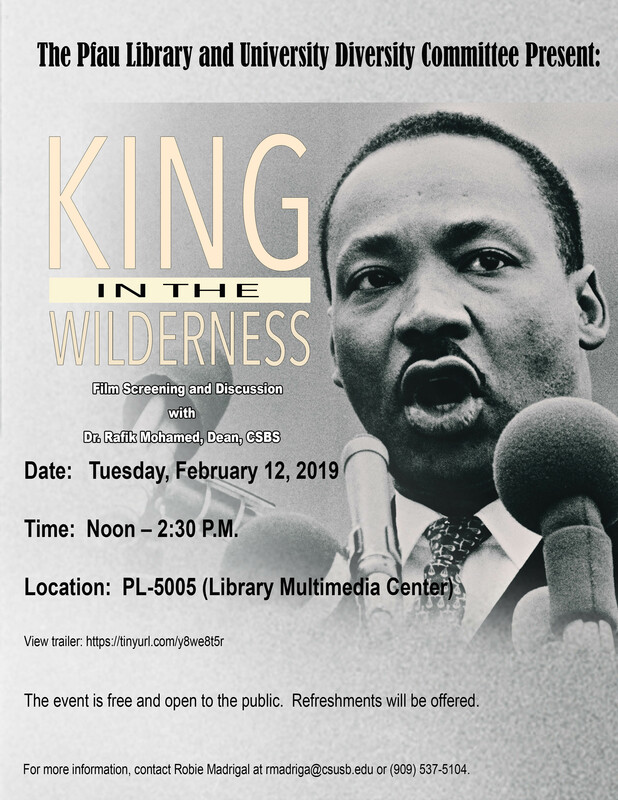 In celebration of Black History Month, Cal State San Bernardino will host a screening and discussion of the documentary “King in the Wilderness” on Tuesday, Feb. 12, from noon to 2:30 p.m. in the John M. Pfau Library’s multimedia center (PL-5005). “King in the Wilderness,” an HBO original documentary, examines the last three years of Dr. Martin Luther King Jr.’s life, covering his work to pass the Voting Rights Act of 1965, his opposition to the Vietnam War, his Poor People’s Campaign, and his assassination. Following the screening, Rafik Mohamed, dean of the university’s College of Social and Behavioral Sciences, will facilitate a discussion. All attendees are encouraged to participate in the conversation. Light refreshments will be offered during the event. The screening is organized by the John M. Pfau Library and the University Diversity Committee. For more information about the event, contact Robie Madrigal at rmadriga@csusb.edu or (909) 537-5104.